With equities climbing for the third consecutive day, the VIX melted significantly lower, settling -15.6% @ 18.57. Near term VIX outlook is bearish, with equities seemingly headed for a straight up move to sp'1920/50 zone, before resuming strongly lower. Suffice to say... the third consecutive daily decline for the VIX, and the 31s now look a very... very long way up. I certainly don't expect a return to the 30s until the latter half of November. US indexes closed with borderline significant gains, sp +17pts @ 1904. The two leaders - Trans/R2K, settled higher by 1.0% and 1.1% respectively. 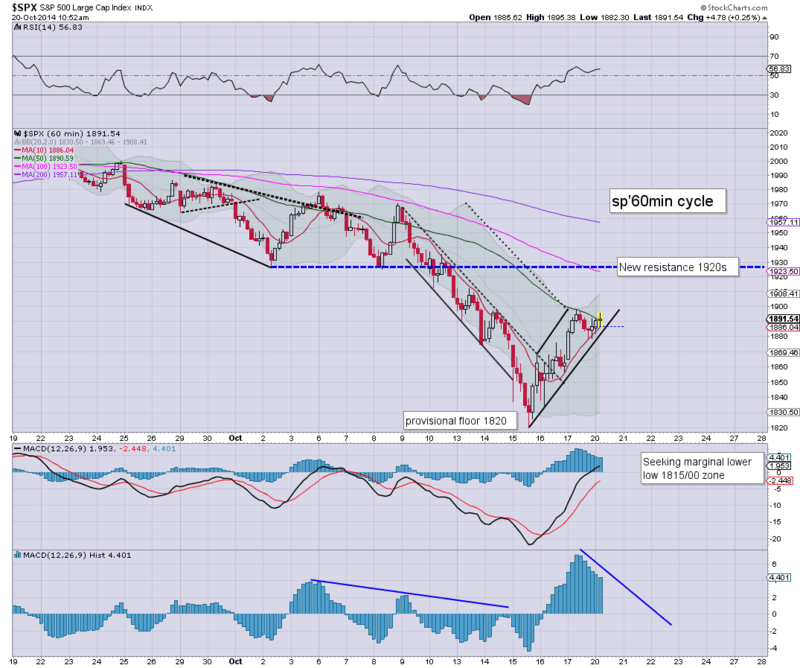 Near term outlook is offering more likelihood of upside to 1920/50 zone, before the low 1800s. ...a rather tedious start to the week, as the bull maniacs managed to re-take the 1900 threshold.. but still a touch below the 200 dma of 1906. Regardless of any continued bounce to the 1920/50 zone (even 1960s seem just about viable), the monthly cycles are warning of serious trouble in mid/late November. US equities look set for minor weakness into the close, as supported by the smaller 15/60min cycles which are set to turn negative early Tuesday. Near term outlook offers threat of a continued straight up move to the sp'1920/50 zone.. before the next major down wave. It remains a messy situation for those who are now holding to a broader bearish outlook - as I am. Regardless... its not like we've not seen these type of bounces before. At best, bears might get a close of 1892/90.. but that doesn't come close to breaking near term support of 1880. 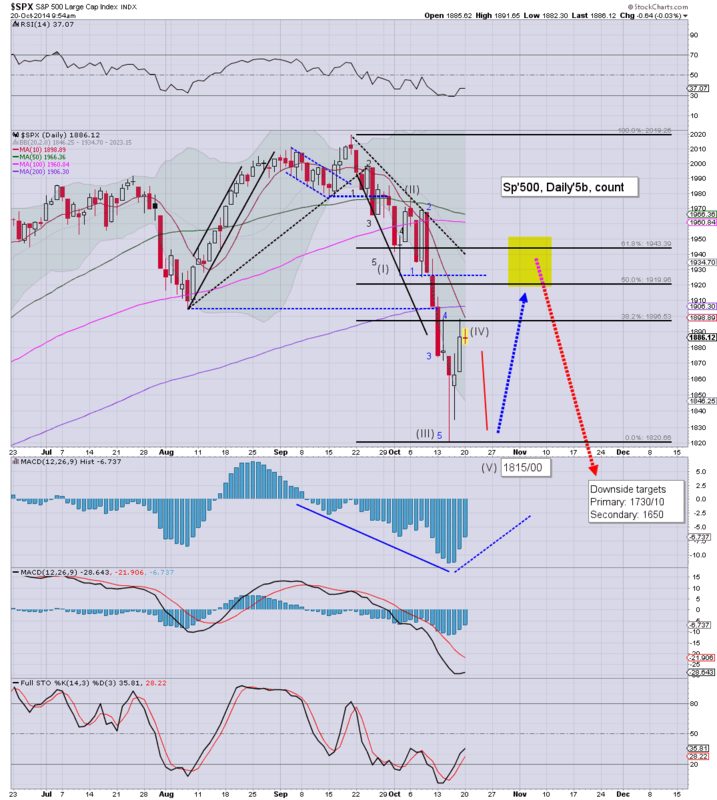 3.14pm.. sp'1903... the 200 dma looms at 1906... after that... the old broken 1926 floor.... and then 1950/60. By then of course, almost everyone will be on the 'new historic highs' are coming train. So much for weakness into the close.. merely day'3 UP for the bulls (not including the Wed' recovery day.. which still closed red). Equities remain stuck, any renewed strength this afternoon will offer the bull maniacs a daily close in the sp'1900s, which will open up the 1920/50 zone. VIX remains significantly lower, -10% in the mid 19s. Seen in the smaller 15min cycle, we're clearly stuck at the Friday high. As ever, it won't take much of a kick to start hitting short-stops.. and if that is the case... then another 2-3% higher seems probable... as depressing as that is. 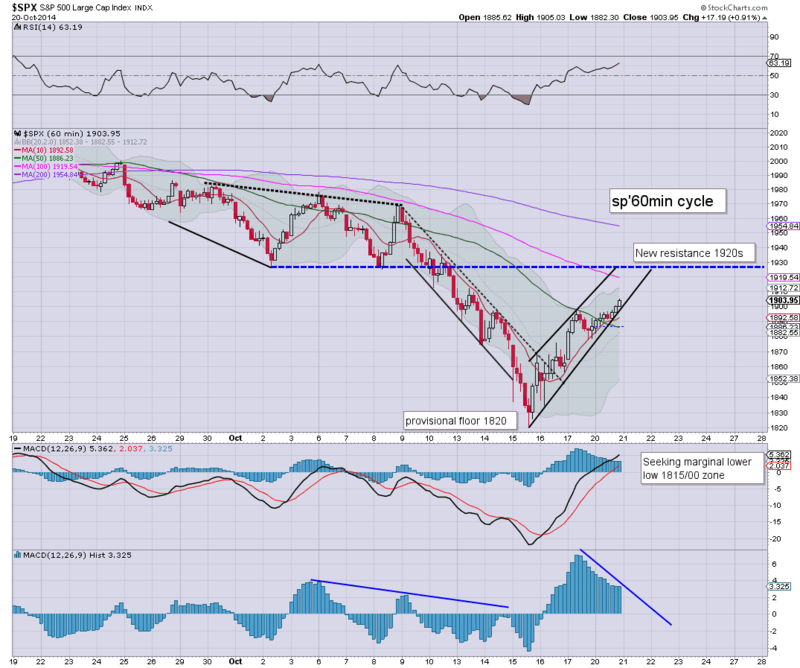 Regardless, no bounce will do anything to negate the critical damage that has been to the giant monthly cycles. 2.29pm The break to sp'1900, no doubt rattling some out there. With VIX -13%.. in danger of losing the 19s. That makes for one hell of a decline from 31s last Wednesday. 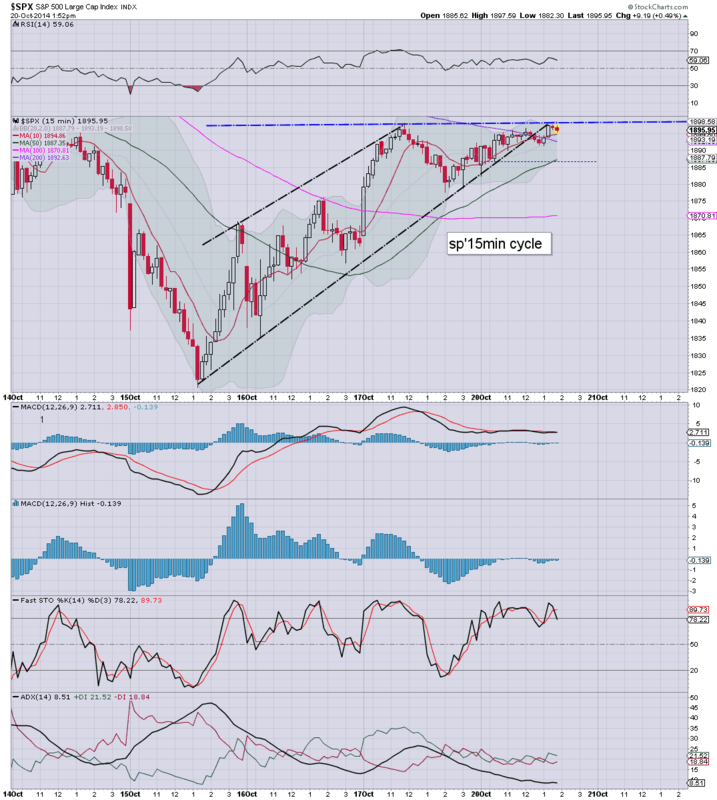 Equities remain within a holding pattern, battling to find a direction. Resistance remains the sp'1900/05 zone, with near term support of 1880. A break <1880 would open up 1815 or so, within 2-3 days. VIX is showing no market concern though, -10% in the mid 19s. Right now the notion of a sub'5th remains very marginal. Any daily close much above 1900/05 will negate the scenario... but... let me be clear, the broader outlook would remain bearish. Notable weakness, Nat Gas, -2.5%, having lost the key $3.70 support level. Equities remain stuck between next resistance of the sp'1900/05 zone, and near term support of 1880. VIX remains subdued, -10% in the upper 19s. The daily close... will likely determine the rest of the week. Little to add... whilst we remain in a holding pattern. US equities remain stuck between the resistance zone of sp'1900/05 and the short term floor of 1880. The daily close... either side of that, will likely determine the rest of the week. 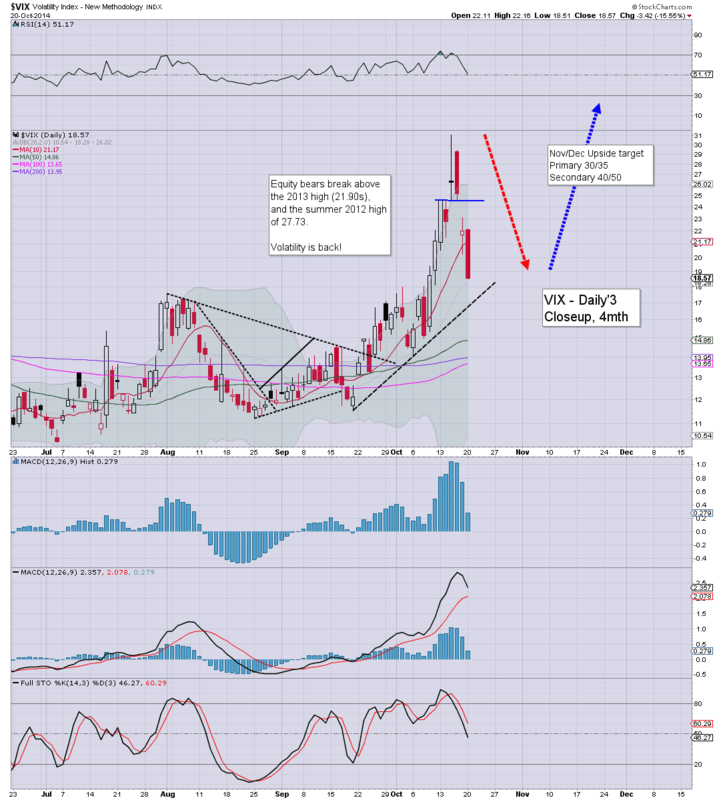 VIX is showing nothing good for the bears, -8%, having briefly lost the 20 threshold. It remains a bit of a messy start to the week, but what is clear, the bulls are not seeing the follow through from last week. Considering the ramp from last Wednesday, bears need a daily close <1880. US equities open with some mixed weak chop. The Dow is notably weak, almost entirely due to IBM (-7%). VIX continues to cool, -3% in the low 21s. Metals are holding moderate gains, Gold +$8. Nat gas' is significantly lower, -2.6%, having lost the $3.70 support. 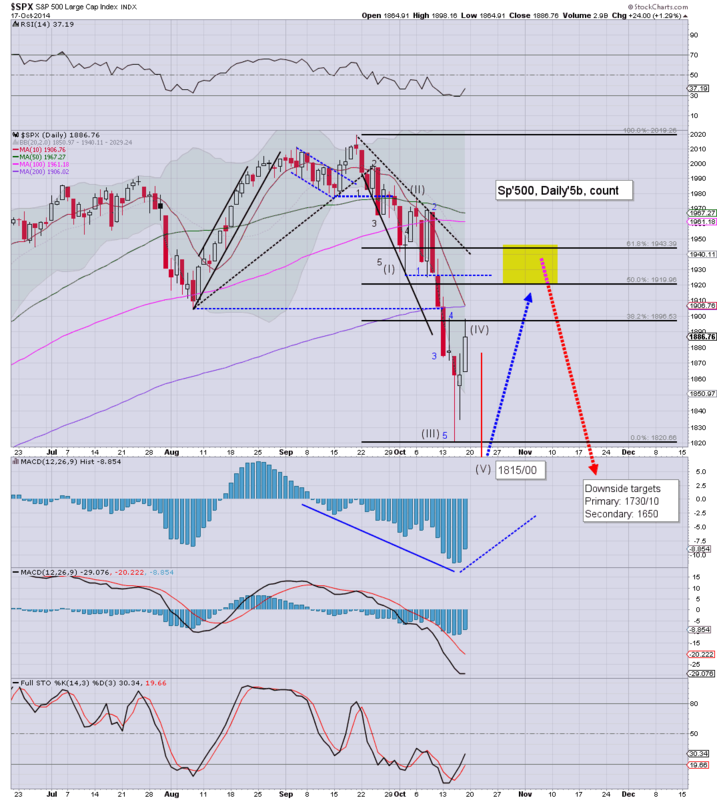 Market is looking tired, despite an overnight futures attempt to break back above sp'1900.. and the 200 dma. There still seems high opportunity for a 2-3 day push lower, to 1815/00 zone. Good morning. Futures are mixed, sp'500 is set to open u/c @ 1886, whilst the Dow -75pts, with the R2K --0.4%. Metals are higher, Gold +$9, whilst Oil is a little weak, -0.2%. Equity bears need to hold under sp'1900 to offer a sub'5th wave, before a larger bounce. Futures have swung from overnight gains of around 0.6% or so, and we're moderately negative on most indexes. In the scheme of things, its not a huge move, but for the bears.. it makes things a lot more 'comfortable' to start the week. I'm still open to the notion of another minor wave lower, a sub 5, E, or whatever you want to call it, taking out the recent low of sp'1820. On no basis though do I expect sustained trading <1800 for at least another 2-3 weeks. 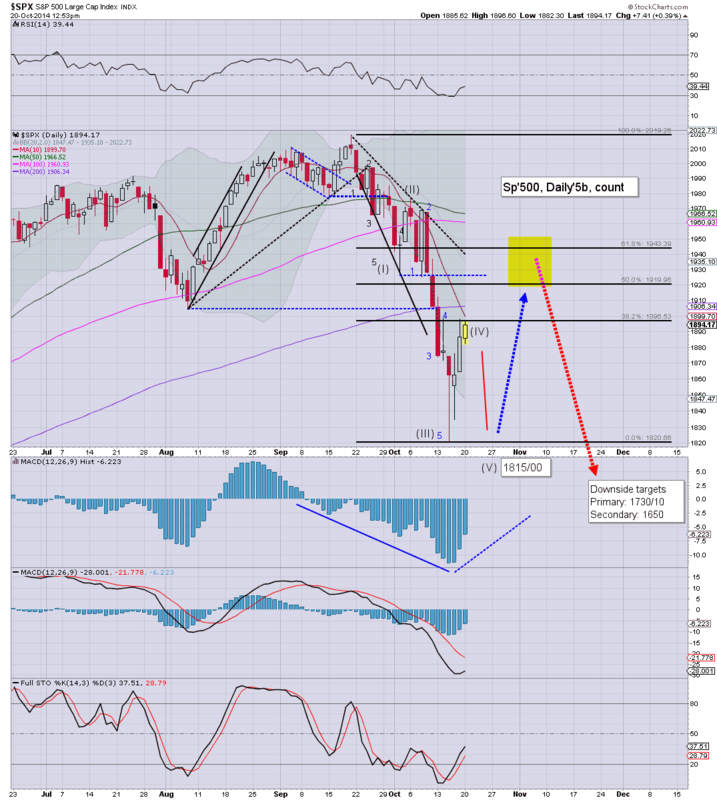 Best guess.... 1815/00 zone... before 1920/50... and then a 'crashy' wave of 10/15%. Notable weakness, Natural gas, -1.4%, having lost the key $3.70 level, next support 3.30/20. Notable weakness, IBM -8%... not pretty. *AAPL earnings due at the close of today.. so.. its a tech heavy day. 9.42am.. opening chop....sp'1900 looks out of range for the bulls today.